Accurate to within 0.005mm (0.0002"). A compact Screwcutting centre lathe featuring back gearing for low speed, high torque machining. Constructed from cast iron, steel and stainless steel, each machine is individually hand fitted by an experienced engineer. A test certificate accompanies each machine. The 90ME is mounted on a rigid yet, fully portable aluminium base with integral motor and electrics. A one piece massive iron casting of cantilever form incorporating auto-traverse clutch box. The bed is dovetail in form and ground on all faces. 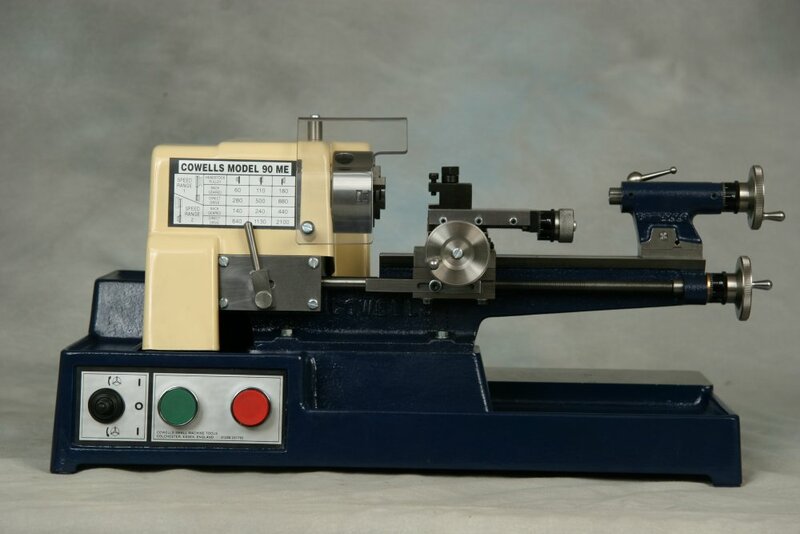 A central Tee-slot provides a positive and accurate location of the tailstock. A gap in the bed allows for the swinging of a loco wheel or flywheel. All Cowells slides are dovetail in form and incorporate adjustable gib strips for the elimination of play and wear. The saddle and the long tee slotted crosslide are both of cast iron with the crosslide ground on all faces. 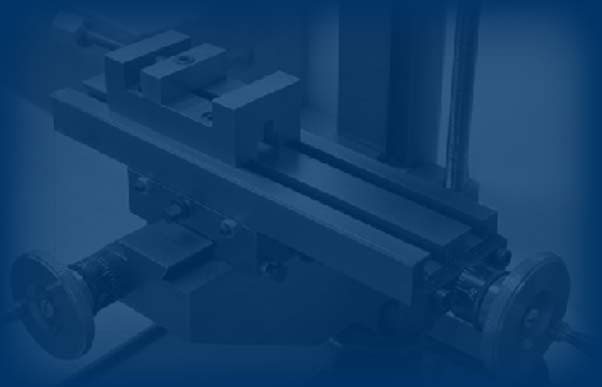 The long tee slots of the crosslide permit the mounting of accessories such as the Vertical Milling Slide (RG55), Rear Toolpost (RG41) Milling Head (RG85) and may also be used as a table for in line boring. The crosslide has a computer laser etched angular scale 45-0-45 and carries the swivelling Topslide to permit taper turning. Handwheels are stainless steel and fitted with highly accurate re-set to zero calibration dials. The clearly marked dials are graduated in 50 increments of 0.02mm. The saddle carries an apron clasping the full nut in which the leadscrew runs. The headstock spindle drives the auto-traverse gear train through a clutch that when engaged drives the leadscrew and saddle. An adjustable trip-off bar disengages the longitudinal feed to facilitate turning up to a shoulder and to avoid accidental chuck collision. Adjustable trip-off bar facilitates turning up to a shoulder and the prevention of accidental collisions. Driven from the lathe's headstock spindle the gear train powers the main leadscrew through a clutch mechanism thereby providing longitudinal feed. Standard set up feed rate is 0.05mm (0.002") per headstock spindle revolution. This feed rate may be varied by incorporating a different gear (changewheel) from the Screwcutting Gear Set (R45). The Screwcutting gears allow for the generation of metric thread forms from 0.312mm up to 3.2mm pitch. Left-hand threads may also be cut by including an extra idler gear within the gear train. The Headstock is a precision honed cast iron casting housing the ground steel spindle and backgearing assembly. Each honed bearing is fitted with an adjuster for the elimination of tool chatter and wear. An adjusting nut is also provided to the rear of the headstock spindle for the elimination of spindle end-float. Spring cap oilers are provided for each bearing. 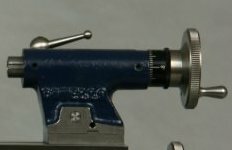 The headstock spindle has a nose thread of M14x1mm and is bored to pass 6.7mm (17/64"). The spindle has an internal no. 0 Morse Taper. The three step headstock pulley is of cast iron and in vee form. The backgear assembly comprises of an eccentric cam and two gears which when brought into mesh with the headstock pulley gear and the large spindle gear (64t) reduces spindle speed and dramatically increases spindle torque. Low end speed (Indirect Drive) is thereby reduced to 60r.p.m. to enable safe screwcutting on the lathe. Back gearing also greatly facilitates the turning of large diameters where a slow surface cutting speed is essential (eg. cast iron flywheels/Loco wheels) and extra power is required due to increased leverage. 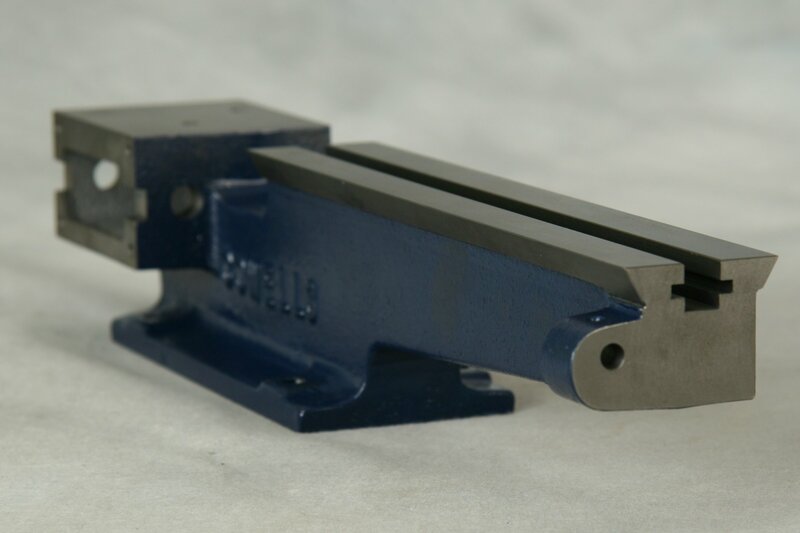 The tailstock is cast iron and is bored and honed to accommodate the ground steel barrel. The barrel has a no.0 Morse taper and will self eject tooling. Locking handles are fitted to both body and barrel. The tailstock may be off-set for the turning of long and shallow tapers. The lathe base is a one-piece aluminium casting incorporating a drip and swarf tray designed for table top use. Cast handgrips are provided for ease of portability, no fixing or levelling is required. The motor is housed in a ventilated compartment with all electrical switchgear isolated in its own compartment. The countershaft assembly incorporating the three step steel pulley driving the headstock pulley is situated above the motor. Double pulleys are fitted to both motor and countershaft providing the lathe with two speed ranges. A fast action cam is fitted for speed changes and belt tensioning. A machined platform to the rear provides a most useful area for the mounting of auxiliary equipment such as the (RG85) Wheel and Pinion Milling Attachment, or to use as a surface plate for a D.T.l. etc. All gears, pulleys and belts are shrouded by a hinged fibreglass cover. A clear perspex chuck guard is fitted. 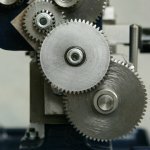 Schalter - Nullspannungs-Sicherheits-Kontaktschutzschalter (Drucktaste) mit erhöhtem Notstopschalter, Wählschalter für Vor- und Rücklauf.